In our monthly Pairings post, we match-up one of our stationery designs with another image—something that is separate in nature but associated visually through color, composition, lifestyle, and aesthetic. This month, we celebrate the silhouette! See other Monthly Pairings here. 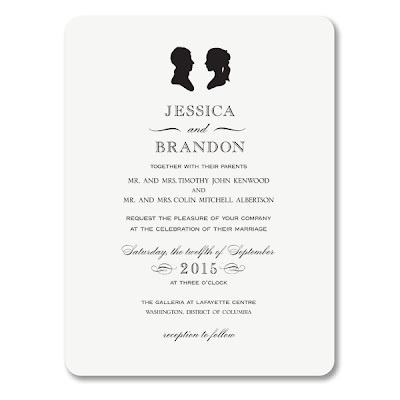 Silhouette art is a two-dimensional profile portrait made with cut paper or a profile portrait filled-in with ink, like our romantically nostalgic Style Me Pretty silhouette wedding invitation. A silhouette also describes the outline or general shape of something like this curvy pair of Biedermeir Chairs from 1stdibs. Note: The word silhouette originated from the name of the French Controller-General of Finances under Louis XV, Étienne de Silhouette. At the time, shadow profile portraits cut from black paper gained popularity as an inexpensive alternative to more formal, painted portraits. 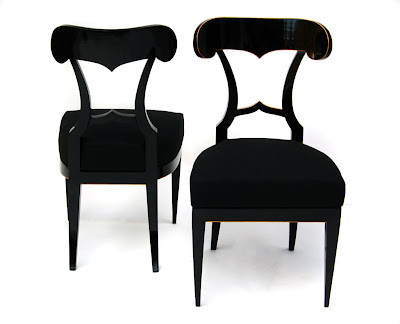 Since Étienne de Silhouette was known for his penny-pinching ways and bare bones budget for 1760s France, the art-form became known as la Silhouette!